Aarni Heiskanen is a Finnish construction innovation agent, an award-winning blogger and podcaster who has received global recognition as a leading construction industry influencer. After graduating as an architect, he worked as a designer and a R&D manager at architectural firms. In the 1980s, Aarni developed tools and processes for collaborative CAD projects, in the 1990s he pioneered in online B2B service and commerce development, and in the 2000s he worked as a strategy and innovation consultant. As a partner at Thinking Portfolio, Aarni devised an online project portfolio management tool that now has over 50,000 users in 50 countries. Today, he is a partner at AE Partners, a content marketing firm, building environmental tech companies and helping trailblazers to reach global audiences. Fabian: As a leading expert in your field, what are the main challenges people are coming to you with and how are you addressing these? Aarni: AEC firms have seen how digitalisation is changing other industries and want to keep up with the development, there are three main reasons for this. Firstly, customers and users want better service and trustworthy information. Secondly, projects are becoming so complicated and fast that manual processes are no longer sufficient. Thirdly, companies want to attract talent that otherwise would prefer "sexier" technology companies. I have helped companies define their vision and lay out strategies and roadmaps for them. Lately, my company has focused on communication services. Communication is essential if you want to change how companies and people behave. We’ve helped the government and businesses in development programs and projects. We've also been involved in organising and promoting technology-related events like AEC Hackathons and international conferences on digitalisation. Fabian: It is safe to say that the Construction industry has seen decades of underinvestment when it comes to technology, why does this need to change? Aarni: R&D spending in this industry has been traditionally low. Even large contractors have relatively few people developing the business and the use of new technologies. I think that one of the reasons is that companies are more project than process oriented. The technological gap between our industry and many others is quite wide. As young people come to work in construction, they are often appalled by the lack of digital tools and processes. As a representative of a construction company told me, the flow of information dies down before it reaches those who work on a construction site. We already have design tools, but they currently serve a small group in a project with dozens of companies. If we want to improve the productivity of people, we have to give them the information and tools they need to do their jobs efficiently. Now, on an average, 70% of a worker’s daily activities do not create value because of the inefficiencies. Fabian: Sustainability is always high on the agenda but how do we balance this with profitability? Aarni: Circular economy will become the norm. I’m sure that after some initial investments and a learning curve companies will make the best of it. They'll be able to move away from one-off project thinking into service-oriented and process thinking. Prefabrication will help, too. It will lead to efficient processes, reduce waste, and make reusable components feasible. Combine it with timber construction, and you'll see some exciting results. Fabian: You have written extensively on AI, how do you see this shaping the Construction industry and what are the negative impacts if any? Aarni: AI is a much-hyped about concept, but it will have a significant impact in the future. It's not going to make humans redundant, but rather give them superpowers. The AI apps I’ve seen, help engineers and designers work smarter. The machine can do part of the rote work. For example, Sweco has used machine learning to develop a design advisor that helps in rebar and steel design. AI and machine learning can also help in decision making and in discoveries. A bot can collect, analyse and combine information in ways that would be impractical for humans. That is useful, for example, in the analysis and optimisation of systems, projects and processes. With big data and AI, we can move from opinion-based decisions into data-based decisions. We choose what to teach the machines to do and where to use them. The threats come from our choices, not from the tools. Fabian: IoT is always a hot topic, but it has a time and place, how do organisations best assess the benefits before making sizeable investments? Aarni: Companies must naturally first define the problem and evaluate how solving it would benefit them; financially or otherwise. They can then set up small-scale experiments for learning purposes and as a proof of concept. Once they have enough data, they can calculate the costs and benefits of the scaled-up solution. A business case study is an excellent tool for that. I think it also makes sense to look at the bigger picture. Separate IoT apps may not be as valuable as a systematic application of apps on a platform that serves several processes. Fabian: Since you engage global businesses, how easy is it to transfer ideas/work practices between regions? It's true that construction has been very local and defined by local business practices, rules, regulations, and so on. Construction technology, however, is predominantly global. We see the same machines used all over the world. Design and management software tools are accessible anywhere on the cloud. Processes, like lean construction, are globally acknowledged. I think that globalisation in this sense will increase. The way we apply technologies and concepts will remain local as long as we have local markets, cultures, and regulations. Fabian: What are the most exciting developments you see coming up in 2019? Aarni: I think we'll see the rise of platform thinking. I mean platforms in information management and industrialised construction. I'm also excited about digitalised, industrialised wood construction. Apart from technology, I expect more emphasis on people and trust. People, not machines, make businesses thrive. How people feel and how they can trust each other is and will remain a critical success factor in construction projects. Fabian has over 20 years delivering ICT Solutions to both UK and Global organisations. Having worked in technical, operational and commercial roles it allows him to engage at multiple levels with his customers. He is keen to link business strategy with technology initiatives to help drive value across an organisation with tangible ROI. 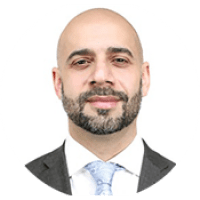 A broad set of skills ranging from Managed Network Services, Security, Voice and Cloud solutions Fabian has a wide sector knowledge but in the past 10 years has specialised in developing partnerships in the Construction Industry. His Construction articles have been released in leading publications and he has interviewed some of the prominent experts in this field.